Fantastic apartment which was close to the station and easy access to shopping centre. Staff were friendly and checkin was easy. Comfortable, quiet apartment. Good location within walking distance to shops and restaurants. Spacious apartments. Excellent location across from huge new shopping center,. Within walking distance to activities downtown. Fullly equipped kitchen. Good WiFi. Staff was good. It is across the street from the big mall. Room was simple but well equipped with kitchenette and large balcony. Rooftop pool had nice covered areas to stay out of sun if you choose. Staff helped us with baggage during reef visit, pleasant group. Room was very comfortable and clean. Would stay again. Spacious clean room. Enjoyed the roof top pool and hot tub. Very helpful staff. 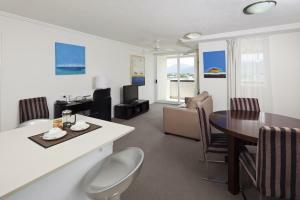 Lock in a great price for Cairns Central Plaza Apartment Hotel – rated 8 by recent guests! Cairns Central Plaza Apartment Hotel This rating is a reflection of how the property compares to the industry standard when it comes to price, facilities and services available. It's based on a self-evaluation by the property. Use this rating to help choose your stay! 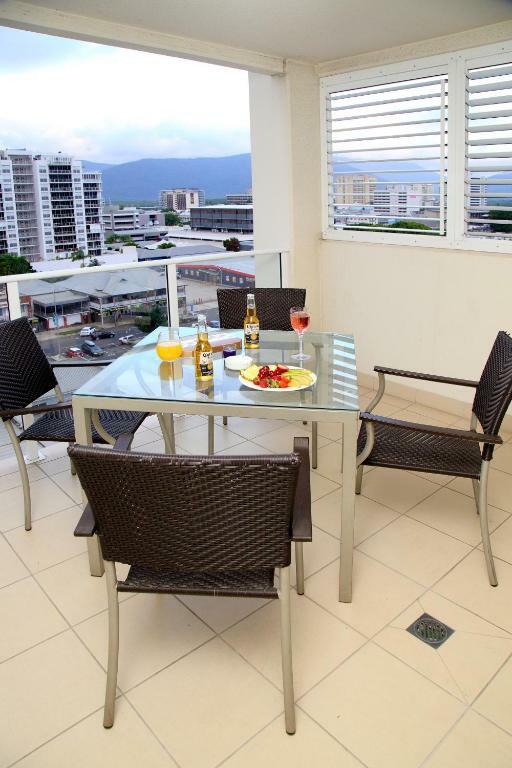 Cairns Central Apartments is a 4.5 star apartment hotel in the heart of Cairns CBD, opposite Cairns Central Shopping Center. All units have ocean or hinterland views. 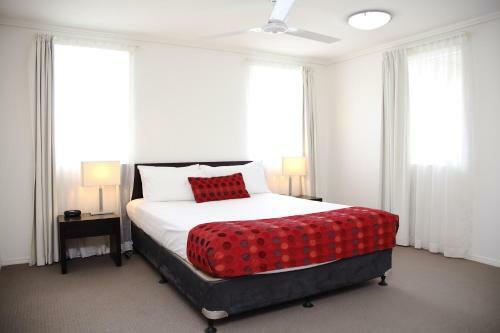 It is within walking distance of popular attractions including the Esplanade, Night Markets, Cairns Convention Center, Reef Casino and nightclubs. Guests enjoy free Wi-Fi. Luxury accommodations options include spacious studios, one, and two bedroom apartments that are elegantly styled and include a fully equipped kitchen, and a large flat-screen TV with cable channels. They feature individual air conditioning in addition to ceiling fans and secure undercover parking. Some apartments have views of the ocean or hinterland. Guests can relax at the rooftop pool and spa and enjoy the sweeping views, or utilize the meeting and conference space that includes an executive boardroom. The on-site tour desk can provide more information on the area and local attractions. 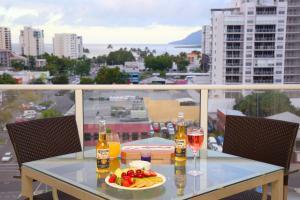 뀐 Located in the top-rated area in Cairns, this property has an excellent location score of 8.5! When would you like to stay at Cairns Central Plaza Apartment Hotel? This spacious studio has a private balcony and an private bathroom. Please note that the price is based on 2 guests sharing 1 Queen bed. If 2 guests use 2 single beds, an additional charge of AUD 20 per stay will apply (see Hotel Policies). Spacious apartment with well-equipped kitchen and separate living area. 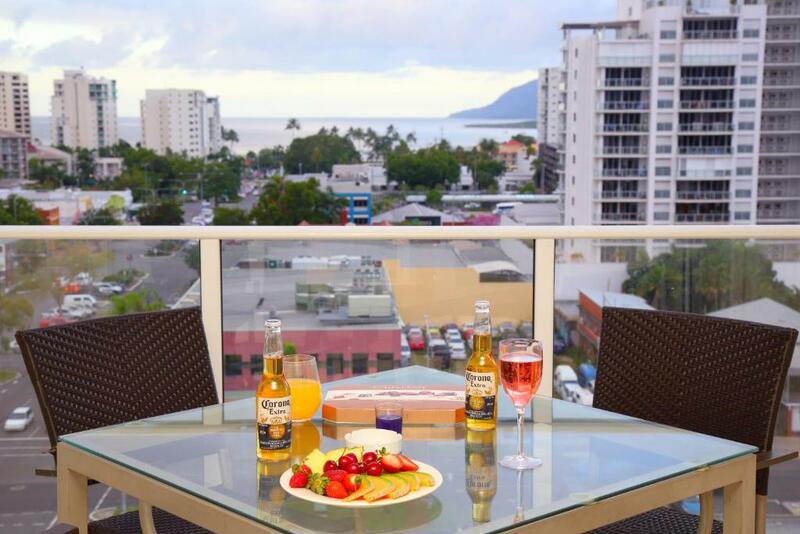 Cairns Central Apartments is the ideal place to stay for a holiday or business trip with a central CBD location that is walking distance to many of Cairns attractions including the Esplanade and beach. 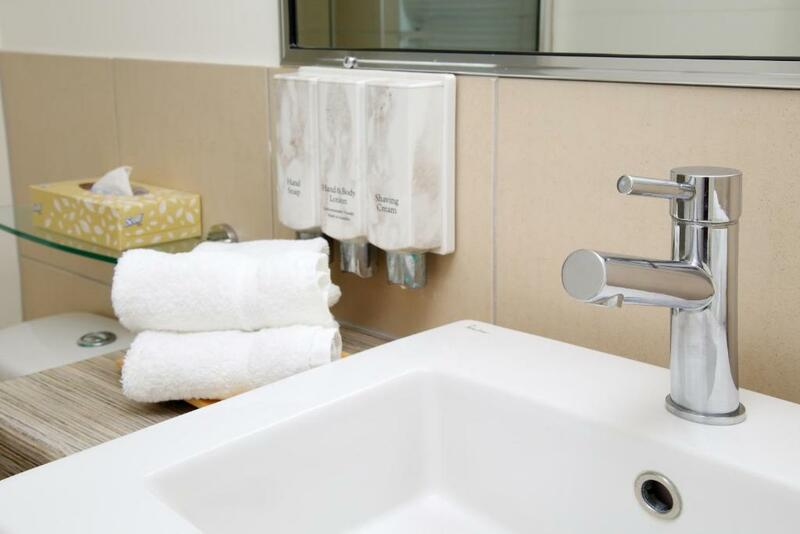 Guests love our spacious rooms and excellent facilities that include a rooftop pool and spa. 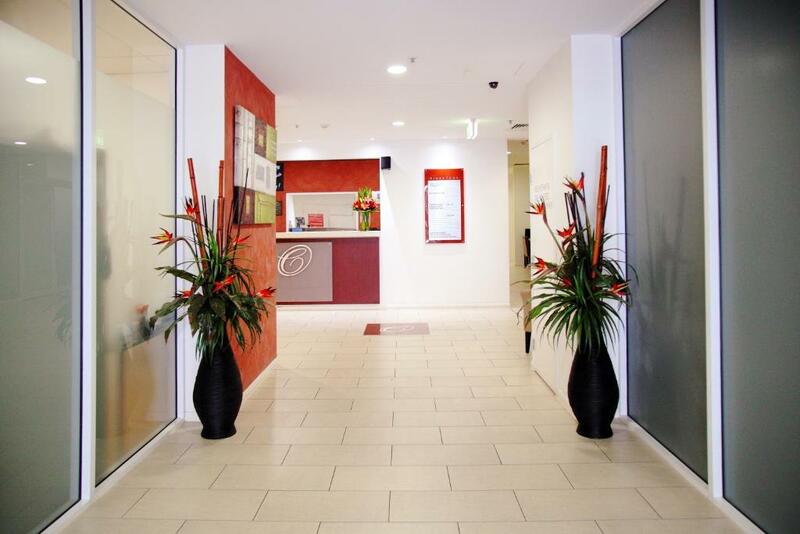 All our rooms include Free Wi-Fi and Foxtel, individual air conditioning and secure undercover parking. You can enjoy the sweeping views of the ocean and /or hinterland from all of our apartments. We look forward to welcoming you to our 4 ½ luxury apartment hotel. Cairns Central Apartments is located in the heart of the Cairns city centre opposite the Cairns Central Shopping Mall. 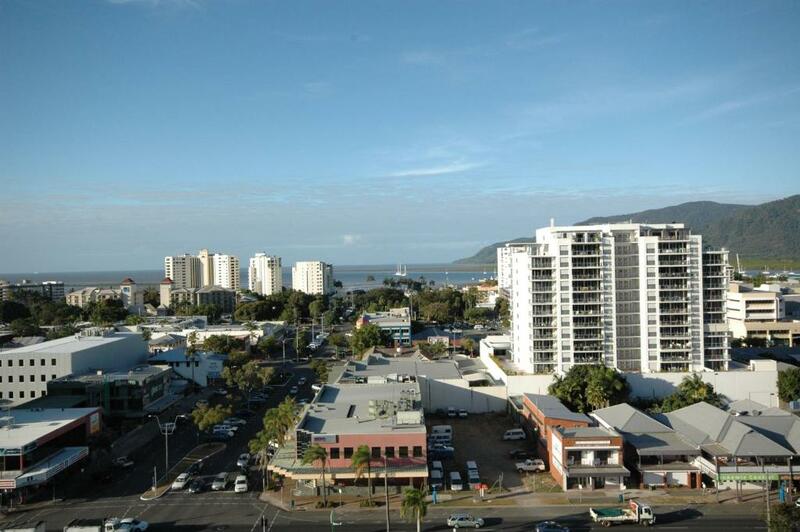 Many of Cairns local attractions are within walking distance including the Esplanade, Night Markets, Cairns Convention Centre, Reef Casino and night clubs. There is lots to see and do in Cairns so be sure to ask our tour desk for more information on the area and local attractions. House Rules Cairns Central Plaza Apartment Hotel takes special requests – add in the next step! Cairns Central Plaza Apartment Hotel accepts these cards and reserves the right to temporarily hold an amount prior to arrival. Guests arriving outside reception opening hours are kindly requested to contact the hotel for instructions on the after hours entry procedure. Contact details can be found on the booking confirmation. Please note that if you require twin bedding there is an AUD 40 surcharge per stay. A bit dusty the carpets ,as I have sinusitis. Efficient answer to phone call as checked in late.Staff friendly and helpful. Everthing was good compare to other hotels. I have stayed some hotels in Cairns. It was quite good with that price. Light bulb blown fan making a terrible noise. The washing machines lid was broken wifi not very good. Awkward design of bathroom. Balcony was enclosed by metal louvres and had two air conditioner outdoor units, but our room only had one air conditioner. Loud and noisy. Rooftop pool. Location is great if going to a show in town. Check in staff friendly and helpful. Prefer a walk in shower. The shower head sprayed water out of the bath onto the floor. Location, with large shopping centre across the road. Only a 10 minute walk to the Esplanade and Lagoon. Have stayed here before with friends so this time i didnt hesitate to book the place again. 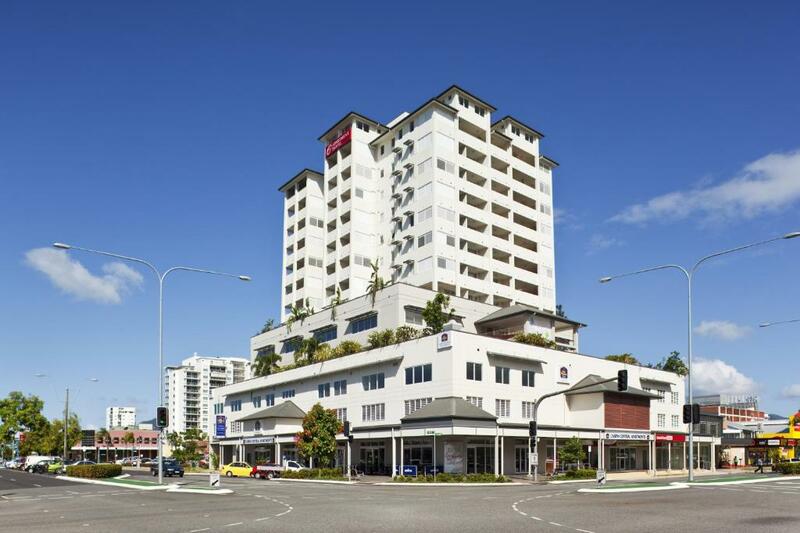 With its close proximity to Cairns Central for shopping (like right opposite the hotel), the place is clean and great value for money. Clean,quiet,good location for shopping etc.Very comfortable. Enjoyable stay. Room was much smaller than expected,sparsely decorated with no laundry facilities. Not a great area for restaurants, requires a cab-ride or long walk. The value was OK for the location as other properties were more expensive. I liked the continental bkfst availability & selection, but was unaware of additional cost. Check-in staff were helpful & stored our baggage prior check-in time as we had tours arranged for earlier in the day. That was very much appreciated. Room was fairly clean & bed was comfy.